This morning I fixed my girlfriends pop-up flash on her Nikon D70 camera. I decided to document the ordeal hopefully to help others with this problem (seems to be a poor design on Nikon's part). First of all; shout-out to Steve and Tony for posting on how to fix this problem. The primary reason for this blog post is to give more in-depth info on what is going on and provide an alternate solution to fix the problem. The flash does not pop up or go off when the shutter button is pressed. First, you should go to Steve's blog post to see how to take the camera apart. His post is great and very well may fix your problem. The parts we will be looking at to fix the flash are the plastic rod, the metal hook for the contact switch and the contact switch. In this picture the contact switch is NOT making contact with the metal hook. If it was, the flash would go off. The plastic rod is SUPPOSED to go underneath the metal hook. 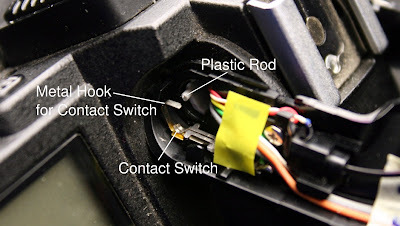 When the flash pops up, it pulls the hook to make contact with the switch, thereby allowing the flash to go off. In Steve's fix, he suggests that you make a hook out of a paper clip and pull the plastic piece out. I tried doing this and failed. In the meantime however, I bent (on accident) the contact switch so that it was ALWAYS in contact with the hook. This made the flash go off, but is a bad idea as it also makes it so the the latch to allow the flash to pop up is never deployed and therefore the flash never pops up (also; when this was the case, smoke came off from a component. Bad.) So yeah.... DO NOT manually connect the hook with the contact switch. Even though this will cause the flash to go off, ultimately it will not work and will probably create more damage to your camera. I figured at this point that taking the plastic rod out was a bad idea because if it went in before, it would probably happen again (and I could not pull it out anyway). What I did instead was super glued a toothpick in where the rod should have been. Now that the toothpick is under the hook, when the flash is up, the hook completes the circuit with the contact and the flash works! I suggest using a small toothpick. This will glue better (super glue works fine) and will be easier to cut off. This is a picture with the flash down. You will notice that the toothpick (I just cut it off with scissors) is not making contact with the hook and the hook is not making contact with the switch. Flash down, flash will not go off. This is a picture with the flash up. Now the toothpick is making contact with the hook which in turn is now connected to the metal contact. Flash up. Flash works. That is it! Now just put your camera back together and hope you did a good job gluing! wow! thats awesome, Thanks! Such great info and so much better than other info i've found on the web! Great pics.! It helped a lot. I found that if one can not pull the white/clear original tip back out, it's because the 2 clips that holds it back needs to be turned so that they are near horisontal when the camera stands on its base. Then they pull out perfect and snaps on the the flash part that turns when it goes up. btw. I got the problem when someone had loaned the camera. Said it had hit something in a amusement park ride. While I was tinkering with the toothpick, trying to get it just right, the black fiber optic cable came out. I tried putting it back it, but got a NASTY shock. It still wouldn't work after putting it back in. I wonder if I fried something. I tried a few other things, including stripping the cable (didn't know it was fiber optic, and it kept breaking), so now it's too short to go in both holes. Yikes. Anyone know where to get a new wire like this so I can try to rescue it? Thanks! I used the plastic sheathing of a small wire. Removed the copper strands and heated up a paperclip and used it to soften the plastic and increase it's diameter. I superglued the small wire-less sheathing (< 1/4 inch) onto the white plastic rod and my flash is back! have you been able to finally fix your flash? While attempting to fix mine, I went exactly through the same steps: black fiber optic cable came accidentally out, got a nasty shock while putting it back, no flash fire even if the switch contact is now properly made. Wasted 2 hours and Got 4 shocks by the leftover electricity! Finally I decided to use the this look stupid and sounds ridiculous toothpaste trick. It works! I have a D50 with what I thought was a similar problem. However, when I took the cover off and inspected the contacts, the little rod is out and the contacts appear to be making correctly. My problem is that I have to push the flash down about half way for it to work. Fully up, it will not recognize that it is up...the clicker that releases the flash to pop up keeps clicking. I still have it open on my kitchen table. Any ideas? Sorry; I am a Canon user myself and haven't ever used the D50. Hopefully someone else will see your question and have a good idea. It does seem like it is some problem with contacts though. I would check everywhere a contact is being made on the flash. Thanks. It fixed my Nikon D70s :) Got 4 pretty huge shocks while fixing it, even without the battery connected!! I used a wider toothpick made of plastic. Didnt use any glue, just "mounted" the pick inside the hole. Fixed my second hand d70 with exact same fault. Luckily did avoid any major shocks. But it took bit of time to see things through and fix it because it was hard to get that white plastic tab in place. But use the paper clip technique to get it in place after several attempts. But worth the time and the effort. Was able to fix mine with a spaguetti noodle glued(and 2 shocks)with superglue. Now works fine. i tried the pulling back thing, but I bent the contacts. does an external flash fix the problem too? Thanks guys. I was able to use a metal pick that has a slightly bent sharp tip that allowed me to reach just inside the white plastic bearing and pull it out gently to snap back into it's original position. I had not used the camera for a while and quickly turned it off as soon as the flashed popped up so it wouldn't charge the flash capacitor. No shocks. And it works now! While this technique may work the real solution is to pull the white sleeve back out far enough that the two tabs grab the black plastic flash housing that rotates on it. I used Steve's technique (http://photorojo.blogspot.com/2010/02/nikon-d70-dslr-flash-fix.html) to do this. The plastic pin that goes under the hook is part of the sleeve, and the sleeve is designed so that the flash housing rotates on it. To repair this common problem correctly the sleeve needs to be pulled back out, not just gluing an extension onto the pin. Be careful not to bend the hook while trying to do this with the paper clip with the bend on the end of it. Yes, I got shocked a bunch of times, but my flash hasn't worked in YEARS since I dropped the camera. I can't believe I fixed it! Incidentally, use a #000 phillips head screwdriver for the cover screws. 1. I could not... or it was very difficult and I lost patience. 2. If it went back once, my suspicion is that it will do it again... I don't want to keep fixing it. Thanks for this workaround! I was just about to loose my patience with pulling out the plastic rod with the paperclip, as it finally got out so I didn't need to use your technique. If problem should come back I'll go for the superglue option. Yay! Glad your camera is working for you now. I used a small needle instead of a toothpick and pushed it under the plastic rod. Hello, any idea where the spring inside the Nikon D5100 pop up flash is supposed to go? Every tip is highly appreciated! Just the info I needed, picked up my old D70 and of course the flash didn't work. Well, now it does and the kids can learn to take photos with something else than phones! i have a nikon D70 and the pop up flash wont latch and stay down, it is ALWAYS up/open. any ideas?